Rajinikanth's Petta, directed by Karthick Subbaraj, will be telecast on the occasion of Tamil New Year on Sunday, April 14. Rajinikanth's Petta, which is the biggest Tamil hit of 2019 at the worldwide box office, is ready for its TV premiere. Yes, the Karthik Subbaraj-directorial film will be aired on the occasion of Tamil New Year. Sun TV, which owns the satellite rights of Petta, has announced the date and timing of its TV premiere. "Pakka thana pora intha Kaali oda aattatha! #Petta on his way to rule your home box office this Sunday at 6:30 pm. #PettaOnSunTV #26YearsOfSunTV @rajinikanth @SimranbaggaOffc @trishtrashers @VijaySethuOffl @BobbySimhaa @Nawazuddin_S @SasikumarDir. [sic]" Sun TV posted on Twitter. Generally, all the leading GECs (General Entertainment Channels) in Tamil telecast big movies for the Tamil New Year to boost its TRPs. It has to be seen what the rival channels will air for the special occasion. However, Zee TV and Colors Super started the celebration early by telecasting Rajinikanth's 2.0 and Yash-starrer KGF. Both movies are believed to have got good TRP numbers. Petta was released in two languages in 500+ screens with premieres on January 9. The film had opened to fairly positive reviews and performed well despite facing competition from Ajith Kumar's Viswasam. The Tamil movie minted over Rs 200 crore at the worldwide box office. 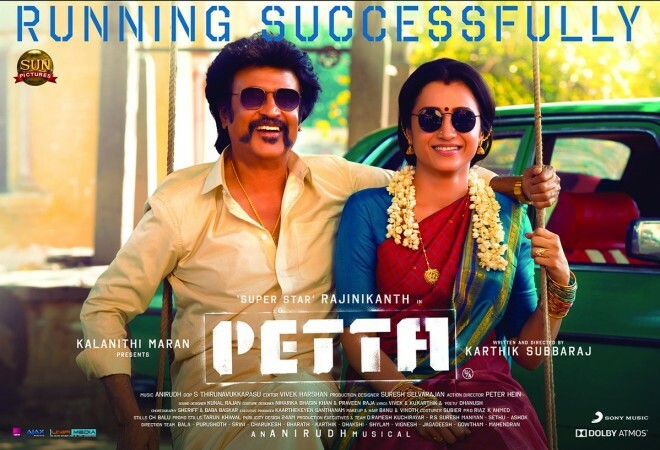 Karthik Subbaraj-directorial Petta is a pure mass-masala movie in which Simran and Trisha Krishnan play the female leads. Sun Pictures has funded the film which is about a man who is on a mission to safeguard a few lives that he loves the most. With the Rajinikanth-starrer performing well at the box office and winning hearts, its TV premiere is also expected to enjoy good viewership.